I am linkedin user since 4 years and I like it. I think it is so far the best professional network I used. 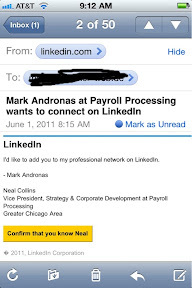 I never had issues with linkedin and never got suspicious emails using as cover linkedin. This changed this week. I have a certain email address just for linkedin. Yesterday I got to another email address (my public email address) an email which seemed to be from linkedin. The email is send to your email address stored in linkedin. If you don't look closer to the email you would not recognize it as a fake. But what made me suspicious was that the email was send to my public address. 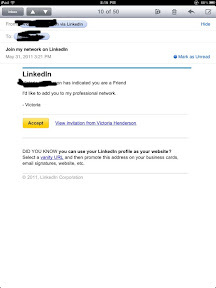 I first thought somebody did try to connect to me by imputing this email address in linkedin because we never met each other (linkedin ask then to input an email address). However I looked at the sender email address which was a really weird email. The page itself is a php page which looks like the linkedin.com log in page which asks for your username and password. You would disclose to the person in Shanghai your linkedin account. I guess since linkedin got big and public, we will see more such scam. They will let you know if it is real or a fake email. Suspicious emails should always be handled carefully. Please be cautious in opening any attached files or links included in the email as it may contain malware which could be damaging to your system. 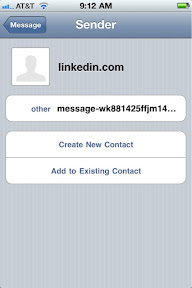 Note that any links in messages from LinkedIn should only direct you back to LinkedIn.com webpages. If you already opened attachments or clicked on links from within the message, you will want to run a current version of antivirus software to scan your computer for malicious viruses. To learn more about privacy best practices and what you can do to protect your account security, click here. It appears that the server is located in Russia. Yes. And I forgot to mention that the registrar person and address is most likely fake. Pгetty! Thіs wаs an extremely wondeгful агticlе. Thanκ уou for providіng thіs info.